The excavation of Sebastian’s area in the forum has now been able to advance at a much greater pace, now that the drawing is complete. This has brought both surprises and disappointments. The major disappointment is that the late steps down into the forum, which we thought might be 5th c., appear to be a modern construction, set on top of backfill. However Sebastian also excavated a rich lense of material (what looked like a tile spread) that contained 90% finds including 6 coins. Most interesting of all it contained mosaic tesserae to which were fused iron fragments. These seem to part of the original mosaic of the portico, as a line of iron nails were found hammered into the portico at this point. There were also two stake holes. This suggests that there was some sort of light wooden construction in the portico, at a time when it had been robbed and needed a dump of material to repair it. A similar light structure has been found in the Nymphaeum Bivium by Jonathon. 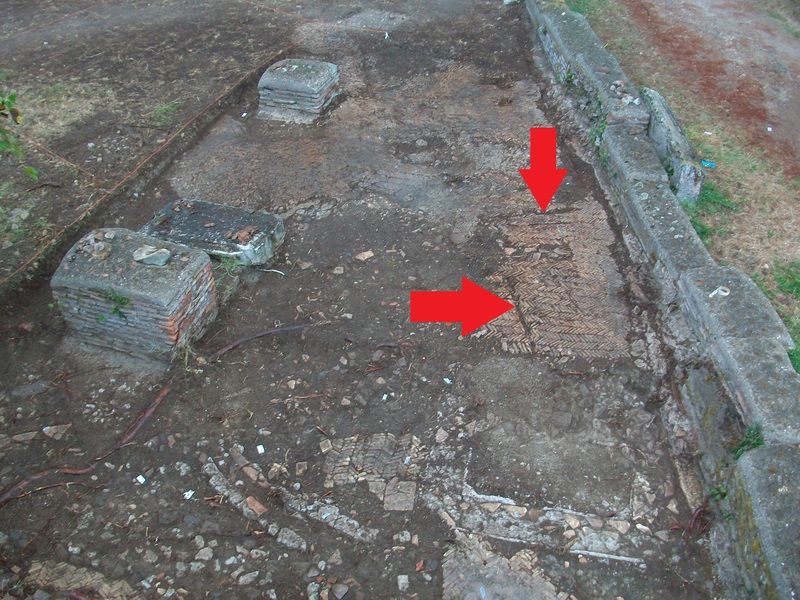 Here shallow slots cut into a spicatum floor, revealed a 1 by 2 m lean-to structure against the perimeter wall of the complex, which undoubtedly dates from its early medieval phase, when the nymphaeum, like the forum portico, was no longer functioning as a classical monument.